The recipe was originally published in November 2010. It was retested with reader feedback, rephotographed, rewritten, and republished for your enjoyment in December 2017. 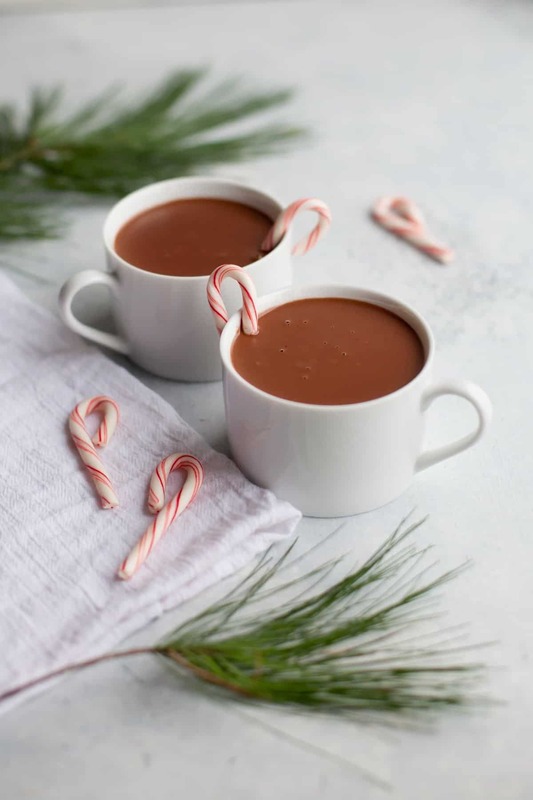 But alas, the hot chocolate drinking in our house is left up to me and Juni—and we happily accept our duties as chocolate drinkers. We don’t have a lot of hot chocolate in our house, but there are a few times when it’s really appropriate. Like after the first snow. 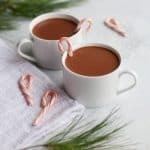 Or, in the case of this festive Peppermint Hot Chocolate, when we decorate our Christmas tree each year! 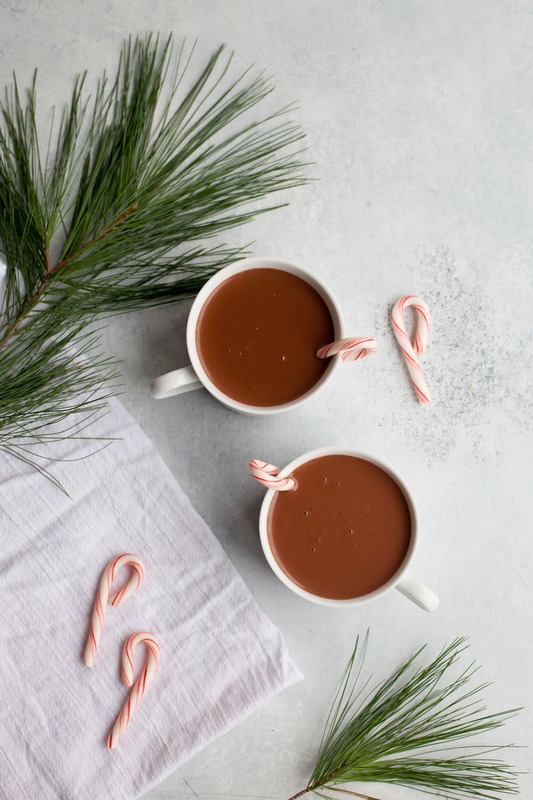 My version of hot chocolate is on the healthier side of the food spectrum—I mean, obviously it isn’t packed with raw kale and chia seeds or anything—but it’s definitely more nourishing for your body than the stuff with the little fake marshmallows from the packet. Refined sugar is out, and instead we use maple syrup (you can also use honey, if that’s your thang). Instead of cow’s milk, I prefer to use full-fat coconut milk to keep our hot cocoa dairy-free. And instead of powdered cocoa, I like to cut up really dark chocolate bars (70%+ cacao) and melt those in. 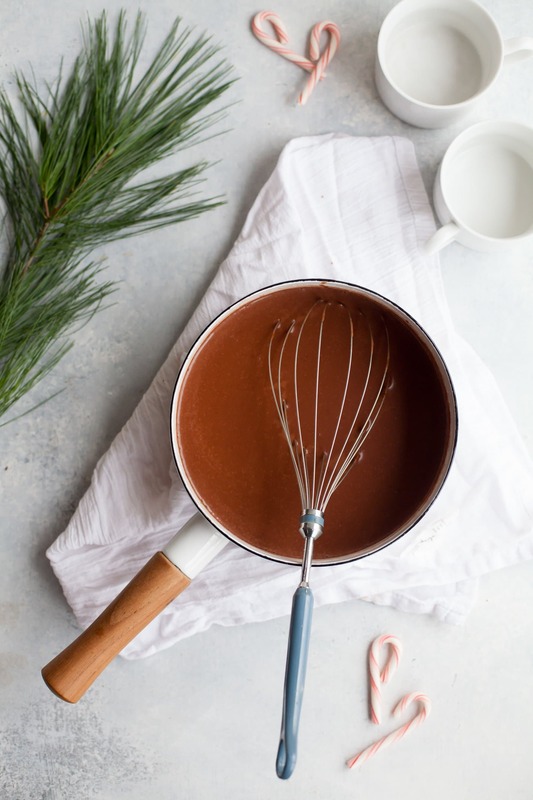 The melted chocolate makes it 100 times more rich and decadent than the powdered stuff. Trust me, it’s worth it. Another place that’s worth it: investing in some good peppermint extract. I don’t know if you’ve noticed, but lower quality peppermint extract tastes so much like straight up alcohol. I love the Nielsen-Massey Peppermint Extract. It’s not cheap, but a little bit goes a long way. Happy holidays, friends! I’m so happy I came across your blog (via Spark)! I really want to start eating more organic so I’m reading as much as I can. Love the peppermint mocha and I love your boots! Nice Santa mug. Where did you find that? I tried the hot chocolate yesterday, and it was so good. If I had known it was so easy to make hot chocolate, I would have been making homemade for a while now. Thanks!! What brand of dark chocolate would you recommend to make this? Thank you! This looks so good that I need to make it?